As comet ISON is approaching for its close encounter with the sun in November, 2013, excitement and anticipation are rising. Already being named the potential "Comet of the century" by some, because of the show it might put on for stargazers all over our planet, ISON might have yet one more surprise for us. An observation of the comet in January 2013 by NASA's Swift spacecraft, when ISON was still near the orbit of Jupiter, showed that it was already very active. The comet was ejecting more than 112,000 pounds of dust from its nucleus every minute. Few astronomers suggest that some dust might end up on Earth. Paul Wiegert, of the University of Western Ontario, has been using a computer to model the trajectory of dust spewed by Comet ISON, and the results of his test show that we might have an odd meteor shower happening during the comets passing. According to Wiegert, around January 12, 2014, Earth will pass through a stream of fine-grained debris from Comet ISON, for several days. He adds that the resulting shower could have some interesting properties. Wiegert's computer models suggest that the debris stream has very tiny grains of dust, no more than a few microns wide, and they will be gently pushed toward Earth by the radiation pressure of the sun. Those tiny grains of dust will be hitting our planet at a speed of 56 km/s or 125,000 mph. Earth’s upper atmosphere will almost immediately slow them to a stop, because of their size. Instead of burning up in a flash of light, they will drift gently down to the Earth below. If it happens, the rain of comet dust would be very slow and invisible. Months or even years might pass until the fine dust settles out of the high atmosphere, so don’t expect to notice anything significant. 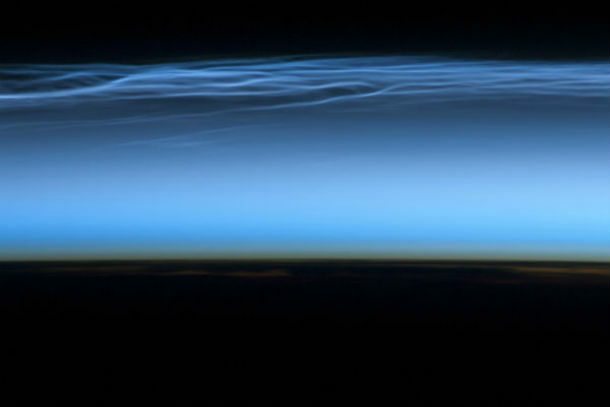 On the other hand, while it’s still up in the atmosphere, there is a possibility that the dust might produce noctilucent clouds or NLCs, icy clouds that glow electric-blue while floating in excess of 80 km above Earth's poles. Those electric-blue clouds over our polar regions might be the only noticeable sign that a shower is happening. According to Wiegert, one more interesting thing is that the shower is going to hit our planet from two directions at once. At the time our planet passes through the debris stream, we will encounter two populations of comet dust. As Comet ISON goes to the sun one swarm of dust will be following. The other swarm is going to be moving in the opposite direction, pushed away from the sun by the effect of solar radiation pressure. Opposite sides of Earth will be peppered simultaneously by two streams of comet dust. So, this dust... is there anything in it that is poisonous or that we should be concerned about that we will be breathing or in our soil/water? 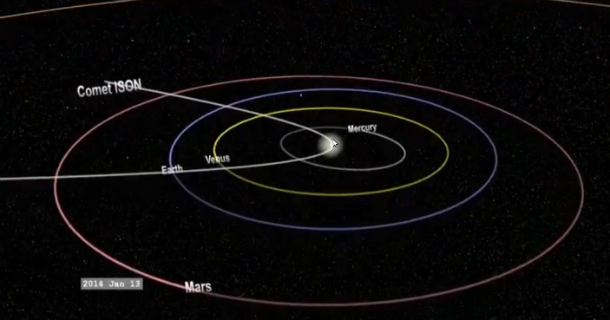 as ison exits perihelion, is it possible that chunks of the comet may become rogue and enter low earth orbit, as its sling shot away from the sun, especially if it was damaged with its encounter with the suns gravity and heat , could this alter the course of its elliptical orbit? I find it hard to believe we have yearly meteor showers (with large fireballs even) even from comets that passed through thousands of years ago, yet from ISON we are to expect only "fine dust that will gently float down to our surface". What what what!?? How about: "We don't really know" or "fire and death and brimstone followed bytidal waves, darkness, and an ice age"??? PS: great point & question whoever asked about the electric charges.. Like a huge CME or EMP. So since the comet is "electrical" with an ion tail/ trail that the earth might/will intersect... My question is could a magnetic storm follow the trail of ions straight to the Earth creating a stronger hit than normal? The mother of all chemtrails. -i don`t believe Comet ISON was discovered on September 21st 2012 by Vitali Nevski and Artyom Novichonok, two Russian Astronomers of the ‘International Scientific Optical Network’. I BELIEVE COMET ISON WAS﻿ DISCOVERED BY NASA MORE THAN 30 YEARS AGO THEY JUST KEPT IT A SECRET. You have been listening to jim mccanney haven't you. Well he IS right about comets being normal asteroids loaded with electric energy from the solar wind. The electric universe theory are correct! Dust from space :? how we know if is just "dust"?